WordPress – tested with 4.9.1 and after. (Based on the technology used, it should work on earlier versions from 4.1 and after. We will test and update this statement when complete). WooCommerce – tested with 3.3.0 and greater. Solely relies on the WooCommerce API, so it is easily tested and confirmed. If you see products and the links work, it is good to go! Your WordPress website needs to be running secure (https – have an SSL Cert – it can be terminated at a load balancer). This is used to make secure calls from the 3D Store to retrieve (read only) product information, product lists, product images, category lists, and products by category from WooCommerce. Without it, you can create your 3D Store, but your products will not show until it is set. We believe this is best practice for 3D Stores, online stores, and working with Application Programming Interface (API) calls to WooCommerce. 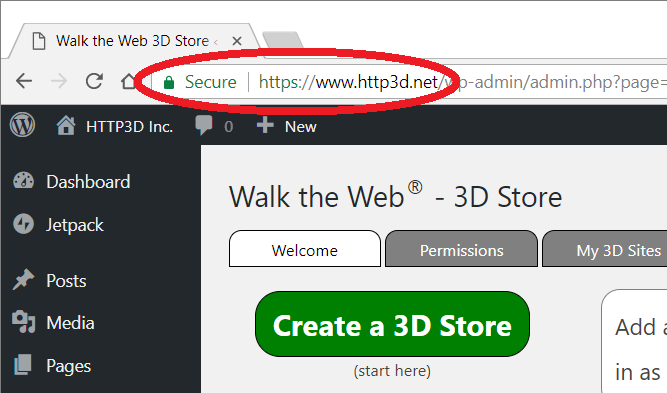 Login and 3D Store are built and hosted at https://3d.walktheweb.com. 3D Store Building templates, 3D Community templates, Help listings, test links, and setting updates are hosted on https://www.walktheweb.com. Allow Popups may be required for some of the test buttons. They open the test pages in additional browser Tabs. 3D Browsing requirements to visit your 3D Store.